Here's a blast from the past. This is an informal shoot for muzzleloading rifles, pistols and shotguns using 25, 50 and 100 yard targets. Goes until everyone is tired, sometimes all day. Hotdogs available off the grill. Break out your Kentucky rifle, Brown Bess or blunderbuss and come on down. All muzzleloading arms are welcome. 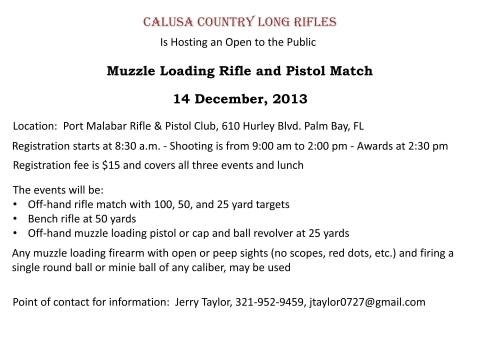 For more information, contact Jerry Taylor, 321-952-9459. We now also shoot on the every Saturday of the month ... can not figure out how to get that in here yet but come on down. We starting at 9:00 AM. Don't have a muzzle loader .... WHY!!!!! ; > ) stop by and try one of ours!!!! See you soon!